High precision dispensing components provide a safe and leak free system for handling liquids and air. 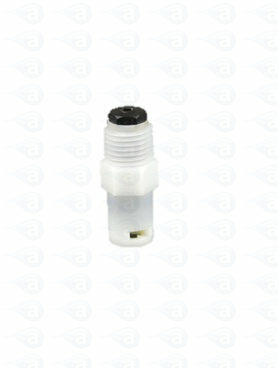 This threaded quick connect fitting is used on the cartridge air cap to provide a quick attachment for all air feed hoses. Threaded adapter fitting to be used with all cartridge retainer caps. 1/4 Inch NPT thread for leak free attachment to top of cartridge cap with a quick connect female to accept 918-000-002 airline hose. Spring loaded quick shut-off will not allow air flow until hose connector is attached. Industrial grade safe to 100 psi. High density nylon. Supplied each. Prices are in GBP pounds. Vat is not charged on orders placed outside the EU and any EU orders are exempt from VAT only if a valid company VAT number is provided to us at time of order or before shipping. Products are covered by a 12-month warranty against faults and malfunction. All orders online are encrypted for safety and security. Please read our privacy agreement for details. We also process phone or fax payments by credit and debit card. Please contact our accounts department if you would like to open a credit account with us. Disclaimer: While reasonable efforts have been made to ensure all information on this website is accurate, Adhesive Dispensing Ltd. do not assume responsibility for any errors or omissions. All specifications, illustrations, data and prices are subject to change without notice.